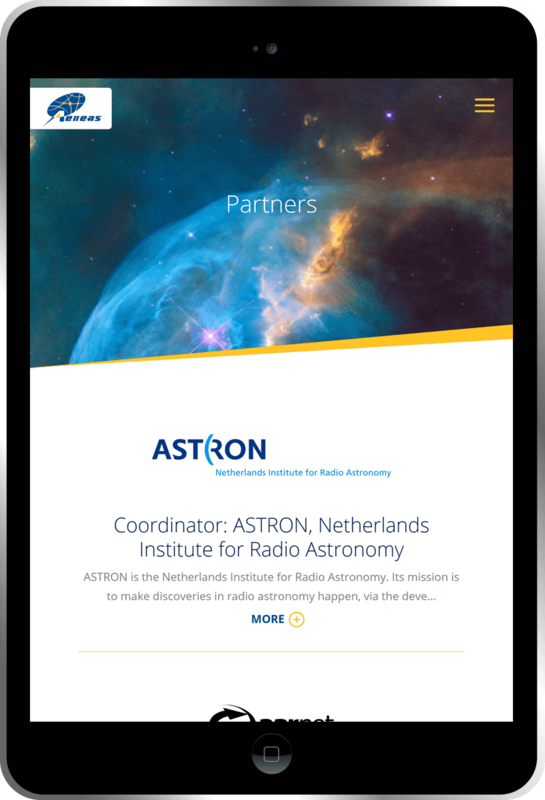 ASTRON, Netherlands Institute for Radio Astronomy, is the primary coordinator for the AENEAS project. 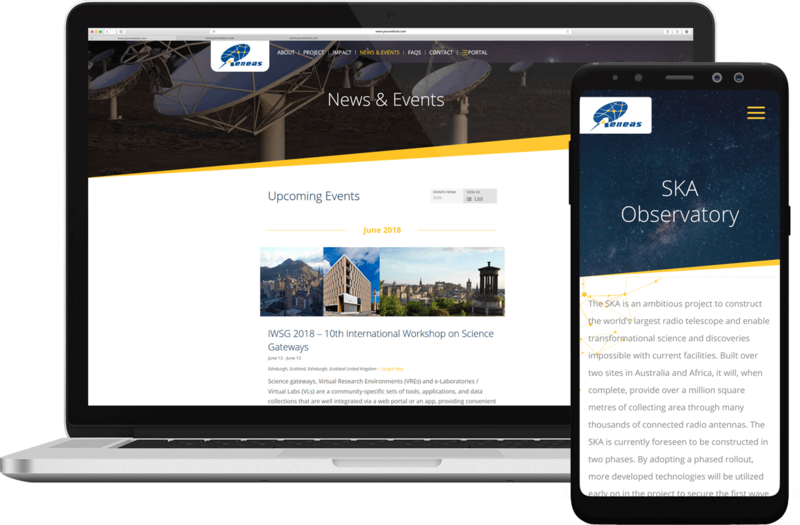 Its mission is to make discoveries in radio astronomy happen, via the development of novel and innovative technologies, the operation of world-class radio astronomy facilities, and the pursuit of fundamental astronomical research. AENEAS is the Advanced European Network of E-infrastructures for Astronomy with the SKA. The SKA (Square Kilometre Array) is an ambitious project to construct the world’s largest radio telescope and enable transformational science and discoveries impossible with current facilities. The goal of the AENEAS project is to build a global data community that will partner to manage and distribute the data collected by the SKA. 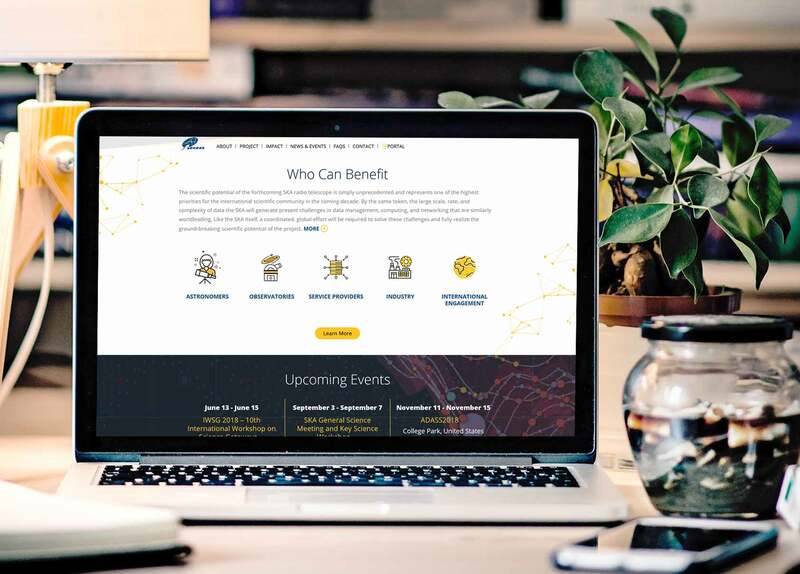 For the first phase of this project, we set out to design a beautiful and inspiring website to present the information for the project and generate excitement within the global community. This site is the tool for our client to share and connect with potential partners and supporters who will be essential to the success of the next phase of the project. The key to approaching this project was to first understand on more than a superficial level what this project is about, building the system that will do the gathering and transmitting of unprecedented amounts of data collected by the SKA telescope, coordinated by a global community working together. We kicked off with the discovery phase, interviewing the client and reviewing the original proposals and documents defining the project. During this time we also worked closely with the client to help define the goals and creative brief for the first phase of the website presentation of the project. Before starting the design phase we also completed key wireframes and site map architecture to ensure the organization of the information was intuitive for any user. As we embarked on concept design we then gathered all available content assets that could be used in visual design including logo, existing copy and many beautiful satellite images the client was able to provide that relate to the project. Working with these, our design team layered in many custom illustrations and elements resulting in an elevated and aspirational sci-fi design that is still down-to-earth and professional. Quality is the intersection of craftsmanship and care. A polished and beautiful website that can be used to promote and share what the AENEAS project is all about. 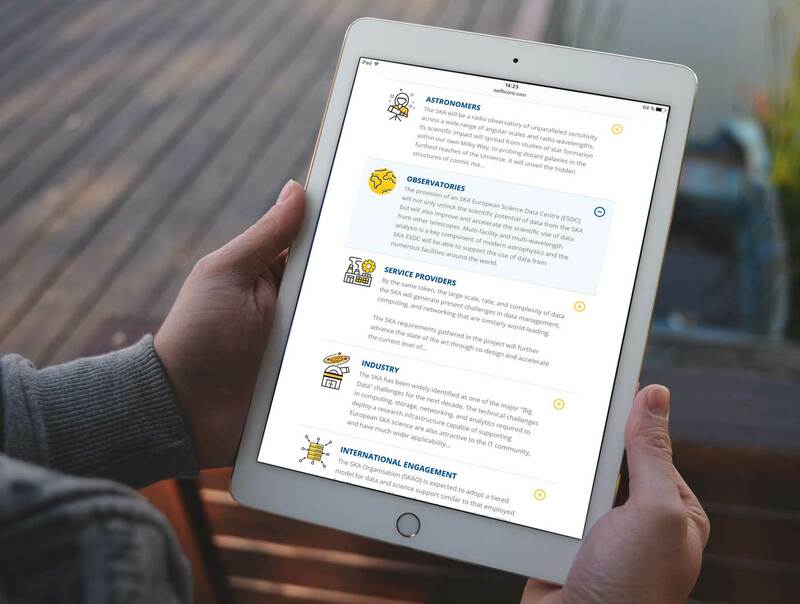 Content that has been tailored for and can be understood by all types of users; you don’t have to be a scientist to understand and get excited about this project. Inspiring individuals and organizations to get involved, AENEAS aims to extend the engagement beyond the immediate SKA collaboration to the wider community.